We are an RV Friendly Destination! Alpana offers both powered and unpowered sites. 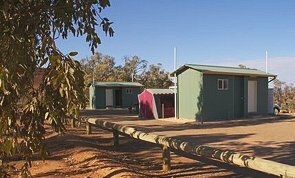 Alpana offers 4 powered sites with private ensuite bathrooms that are perfect for campers and caravanners visiting the Central Flinders Ranges. Modern and clean, they add convenience to your holiday experience. 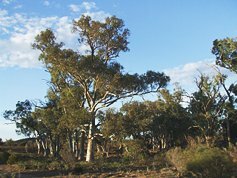 The sites are adjacent to our shearers' quarters in the homestead area and on the tree-lined banks of Alpana Creek. The shelter next to the bathrooms has a gas BBQ, table, bench seats and fire pit for general use. 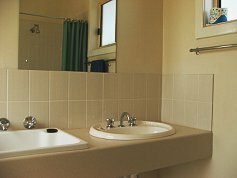 The Ensuite bathrooms offer a shower, toilet, hand basin and wash trough with hot water on tap and are easily accessed by standard cars and vans on a sealed road from Wilpena Pound with a 300m dirt driveway. There are 4 powered sites in the Trees Area Campground strictly for self-contained vans. $10 per extra adult, $5 per child per night. For group bookings of Ensuite powered sites and Quarters, price on application. The facilities were very nice and very clean. I did the Rocky Nob walk and found it fantastic, well worth it. Excellent combination of bush/farm camping with the luxury of electricity and a convenient bathroom (and wash tub). We particularly liked the view from site #4. I hope we can come again! 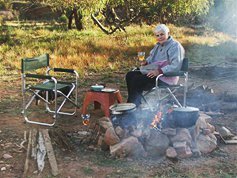 Alpana offers two bush camping areas. Pets allowed. Bush camping with pit toilet facilities. 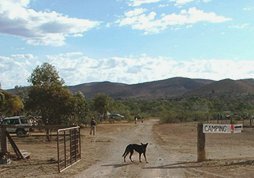 The Horse-yards is set on the banks of the Blinman Creek in the Parachilna Gorge, about 1km west of Angorichina Village, 17km from Blinman and about 23km by road from Alpana Homestead. You need to collect a key from us to get into the area. The Horse-yards is closed to the general public and set off the road to ensure your privacy. 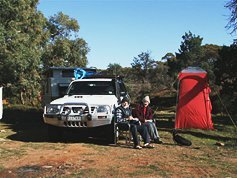 This scenic bush camping area is accessible only by high clearance vehicles and vans and supports four camping spots, with spring water in the creek bed, season permitting. Rates: $20 per vehicle per night. 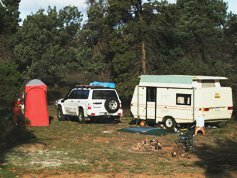 Bush camping with shared pit toilet facilities. 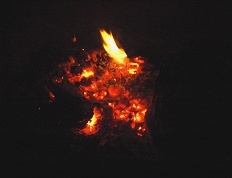 Near the Alpana homestead, 5km south of Blinman. Accessible to standard cars and vans. Choose your favourite spot on the southern bank of Butler's Creek, surrounded by giant River Red Gums and native pine trees. Rates: $15 per vehicle per night. We had a magic time at our camp in ‘Bill's Paddock’ and you were great hosts, thank you very much. We are looking forward to our next bush camp at Alpana. 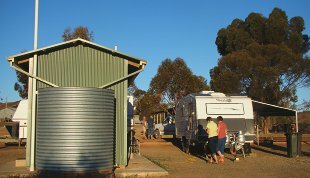 Combine a bush campsite in Bill’s Paddock away from everyone but with an Ensuite bathroom reserved for your private use. Pets allowed. Rates: $30 per night for 2 people plus $10 per extra adult and $5 per child per night. Group discounts apply.